Sadly not an online video slot dedicated to going 10 rounds with Beyoncé, rather a game from leading developer, Microgaming, dedicated to that tried-and-tested slot theme – pirates. In fact, if you’ve ever enjoyed the treasure-seeking thrills of NetEnt’s Ghost Pirates, or Sheriff Gaming’s 3D masterclass, the adventured-themed Lost Treasures, you’ll get a kick out of this. 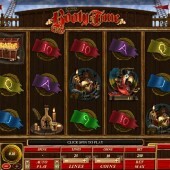 A 5 reel, 25 pay-line slot, everything you need from a pirate-themed slot is here: ship decks, poop decks, decks (of cards) – the lot. Elsewhere there’s the pirate’s cheery parrot, treasure chests galore, bottles of rum and a fair dash of yo-ho-ho. The standard 10-through-Ace symbols are present and correct, but here are made up of different pirate flags. The Booty Time logo acts as the Wild symbol, and substitutes for all regular symbols other than the Scatters. However, it’s that mainstay of pirate slots – the Treasure Chest symbol – that is worth looking out for, as it acts as the bonus trigger. Hit three Scatters on reels 1, 3 and 5, and you’re on your way to winning free spins. First, though, you’ll get to pick a coin at random to see how many goes you have in the following bonus round. Next, pick from various treasure chests to reveal the free spins amounts and multipliers you’ve won. Three spins with a 2x multiplier are yours to kick off with, but obviously can increase if you pick correctly. The spins can be re-triggered, making the bonus round potentially very lucrative indeed. With betting ranging from $0.01 to $0.10 a coin, and with 10 coins a line available, Booty Time certainly appeals to a wide range of slots bettors. 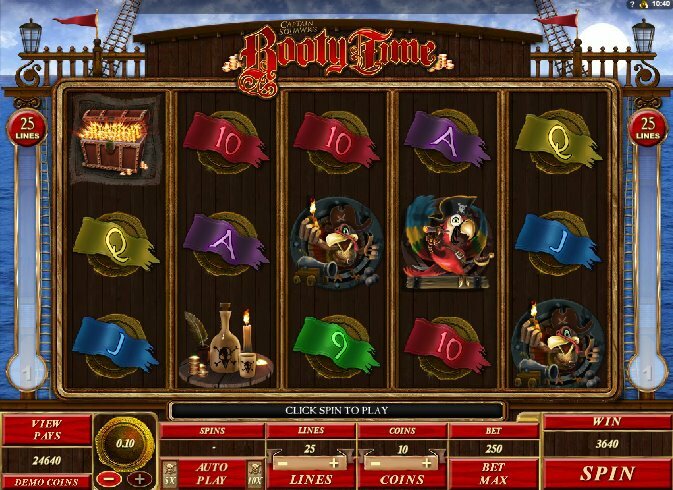 Free spins hounds will enjoy the slight skill element of the bonus spins round – even though the bonus is difficult to trigger to start off with - while the pirate enthusiasts will like the overall feel.